Make Great Wine Even Better! Oak barrel aging can improve the quality of your wine. Oak’s delicate vanilla scent and complex toastiness enhances the fruit flavours and aromas already present. In addition, even a short time in a barrel can mature a wine faster than a longer period of time in a regular carboy. Oak barrel aging can turn an average wine into a prizewinner and is often a common denominator in wines that reach beyond the ordinary. 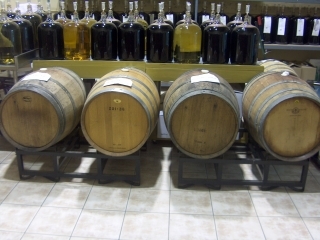 Commonly, only full-bodied red wines and richly flavoured whites (such as Chardonnay and Sauvignon Blanc) are used for Barrel Aging. To a red, it gives a softness and complexity that adds great character. For some whites, it can increase aromatic qualities that make the wine truly special. The natural process of evaporation allows the wine to concentrate its flavor and aroma. As well, small amounts of oxygen are allowed to pass through the barrel and acts as a softening agent upon the tannins of the wine. Just Fine Wine offers select varieties for Barrel Aging, available systematically throughout the year ~ typically every two to three months. The program is open to anyone and is especially popular with true wine lovers. The wines selected for the program are of the top caliber and the process is an additional $50 per batch (23 Litres). Availability is limited and space fills up quickly, so be sure to inquire about reserving yours today.